It’s as if the hand of God – Monty Python’s God – reached down and plucked me, kicking and screaming, from my life, my wife, and my daughter. Ye shall not finish the gates for the picket fence this weekend. Ye shall not attend the concert in Topanga on Friday. But ye shall be locked in a small room and chained to a machine for 21 hours a day. Ha, ha, ha. If given the choice between two weeks in jail or two weeks in a hospital, I’d have a hard time choosing. Would I have a private cell? I can’t imagine the food varies much, though if it were Mayberry and Aunt Bee were cooking, jail might look even better. No one needs to listen to my breath signs six times a day behind bars, but I don’t worry about a shiv to the gut in the hospital, though there are infections, blood clots and other painful add-ons during the stay. Hard choice. For the first time, we exotic animals have our own floor at the zoo, and a gym to ourselves. 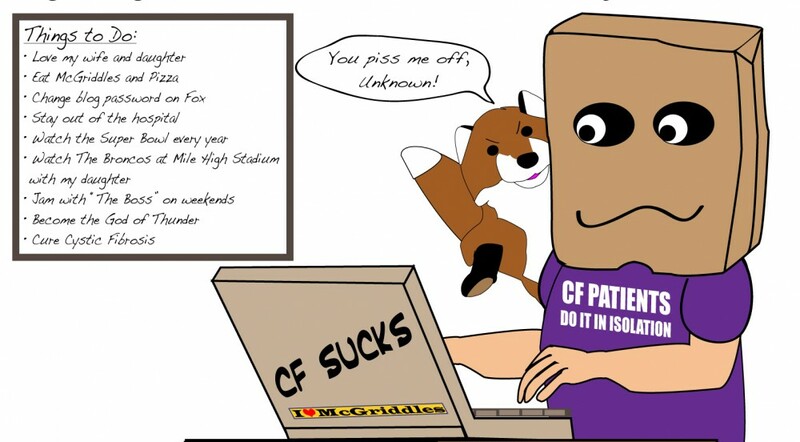 Huge kudos to the CF team here for making stays better for us hospital lifers. This floor is quiet like a library, day and night. No 2 a.m. hallway conversations. No liver transplant teams clogging the way. No unpleasant smells that penetrate your mask and make you lose your appetite. My room is gigantic and begs for a party. It’s a negative pressure room with a space-lock entry room. The main door is hard to open and makes a whoosh sound like opening a walk-in freezer. I thought the 100-year-old PCT was going to have a heart attack wrangling the scale through the double-door system. I have a great view. And best of all I can see and hear the trains, which I love. I just added, “hop a train and ride it to Arizona,” to my bucket list because that’s what I think of when I watch them. Could I run fast enough to catch one? Doubtful, but if I could I would. 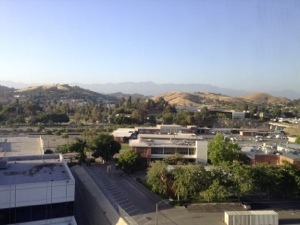 I’d have my wife and daughter in a chase car, as I rode along listening to the sound of the wheels on the rails, breathing the fresh air (once we got out of LA). Destination: Phoenix hotel with a large pool and water slide. Before I checked into this sterile bed and breakfast, I told the doctor I thought I had a thyroid or auto-immune problem. The blood tests came back and it looks like its door number two. More to come on this development. Knock on wood that I all have to report is what I just wrote. They haven’t killed me yet, but I’ll let you know when they do. Healing thoughts being sent from all of us. Hang in there and am wishing you the very best. Hope you get out of the clink soon. I won’t even (hardly) mentiion the Dodgers/Braves games most recently. Don’t want to upset you. Braves even managed to string along some hits and small ball. Maybe you can get home to that picket fence project you’ve mentioned in a few more days. Glad you’re back home doing some project work! !